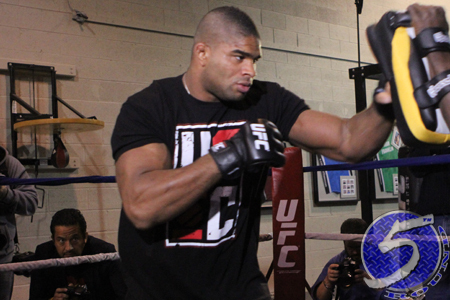 On Wednesday, a heavyweight scrap between Alistair Overeem (pictured) and Ben Rothwell was added to the UFC Fight Night Foxwoods lineup. The September 5 event takes place inside Foxwoods Resort Casino in Ledyard, Connecticut. Overeem collected a much needed win by beating Frank Mir at UFC 169 to snap his two-fight losing skid. “The Demolition Man” was knocked out by Travis Browne and Antonio “Bigfoot” Silva prior to February’s victory. This marks Rothwell’s first fight since getting suspended nine months by the UFC for elevated levels of testosterone. His TKO win over Brandon Vera was not overturned to a no contest by the Wisconsin Department of Safety and Professional Services, the commission who oversaw UFC 164.